The Western Bean Cutworm is a native of North America that has recently expanded its range eastward from the Great Plains region. Following its initial discovery in southeastern Iowa in 2004, it was found the following year in western Illinois and in northwestern Indiana in 2006. 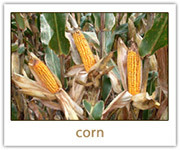 Although primarily known a pest of field corn in many areas, its broad host range also includes legumes and it can be a pest of dryland beans (but not soybeans), where they are grown in abundance. It is not a true “cutworm” in that it feeds on the reproductive parts of the plants, and not by cutting stems as many cutworms do. 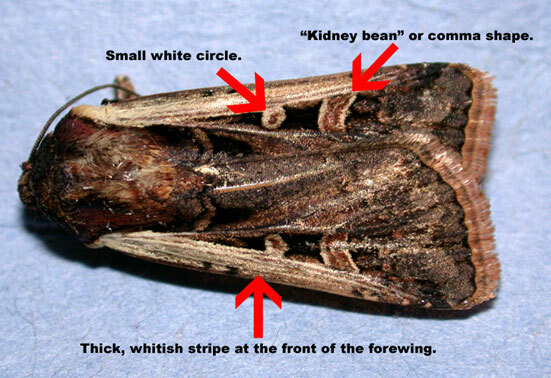 The western bean cutworm is a late-season pest and its feeding can cause both yield loss and degrade quality of grain. One generation occurs each year. Moths are primarily grayish-brown in color with a wing-span of approximately 1-1/2". The primary identifying characteristics are a whitish stripe at the front of the forewing with two cream-colored, outlined shapes immediately behind. Other identifying marks are a circular spot approximately halfway along the length of the forewing and a kidney-shaped mark along the same line, approximately 2/3 of the way to the wingtip. Moth emergence begins in early July and usually peaks in the middle of the month, when male moths can be monitored using pheromone traps. Female moths will mate and lay eggs during July and August and will oviposit on a variety of cultivated and wild plants, although dryland beans and field corn are the most commonly chosen oviposition sites. 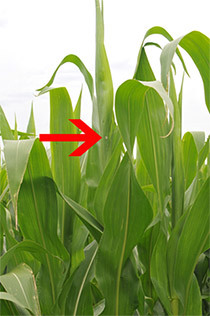 Cornfields in the late whorl stage are preferred by female moths, who are seeking to lay eggs on corn that is near (but not past) pollination. Eggs will be laid on upper surfaces of leaves, often on leaves near the whorl that have not unfolded completely and vertical in orientation. 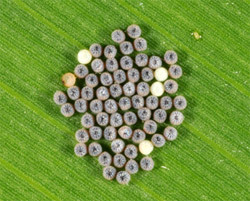 Eggs are laid in masses of 20-200, but usually average around 50. Eggs are white when first laid, and become tan as eggs begin to develop. In about a week, eggs develop a purple coloration, indicating that hatch is imminent. Freshly laid egg mass next to pollen and anther from the tassel. Dark, purplish eggs are soon to hatch. Hatching larvae eating their egg shells before seeking shelter. Three larvae, of various sizes, have found food and shelter in this leaf axil. Early instars (left) are lacking the identifying black rectangles that develop with older larvae (right). Following emergence, first-instar larvae will consume their eggshells, making post-hatch scouting for empty masses impossible. 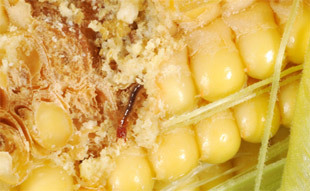 Larvae will then move into protected areas of the corn plant, feeding on leaf tissue, fallen anthers/pollen and silks on their way to their destination, the developing ear. Newly-hatched larvae are initially dark with black heads, this color will lighten to a light tan or pinkish hue with subtle longitudinal stripes as they develop further. 4th-instar and larger larvae, ½ to 1-1/2 inches long, are readily identified by 2 black “rectangles” behind the now-orange head, and a generally smooth skin or cuticle (i.e. lacking tubercles, warts, or bumps). There are 6 larval instars, the 6th is most conspicuous and often found feeding on mature ears, usually the tip but sometimes the sides. Entry holes and/or frass are not always visible, so scouting for larvae must include removing husks. 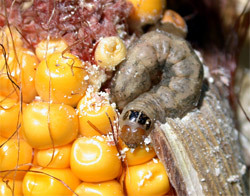 Several larvae may be found on a single ear, because these caterpillars (unlike corn earworm) are not cannibalistic. 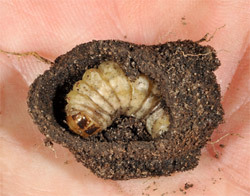 In late summer and early fall, 6th instar larvae drop off the plant and burrow into the soil, where they construct an earthen chamber using salivary gland secretions. Sandier soils allow for larvae to penetrate deeper into the soil profile that increases winter survival and avoidance of tillage implements. They will remain in a quiescent state (pre-pupa) throughout the winter and will pupate and complete development during the following spring and early summer. Mature larva feeding near the ear tip. This pre-pupa within an earthen cell was found 9 inches deep in sandy soils. 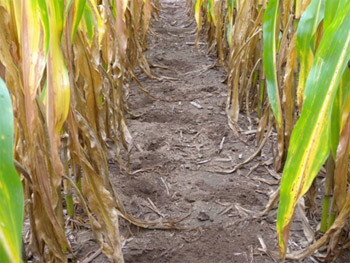 Oviposition and subsequent damage are often very patchy in fields. 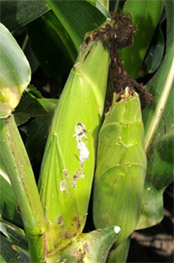 Multiple larvae may feed on a single plant/ear. In addition, there is likely considerable inter-plant movement early in life which results in infestation of neighboring plants. Most feeding is concentrated on the ear, and yield studies conducted in Iowa and Nebraska have shown that an average of one larva/plant throughout the field may cause yield loss of approximately 4 bu/acre. 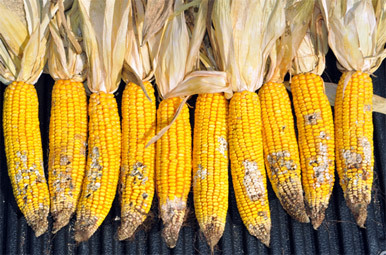 Damaged kernels are prone to molds, decreasing grain quality of food-grade corn varieties. At harvest, many emergence holes may be noticed in dry husks, this is often the first indication that WBC has been present in the fields that haven’t been monitored. Indiana counties with confirmed WBC damage in 2009. Damage in most fields did not reach economic levels. Range in severity of ear damage caused by WBC larvae. 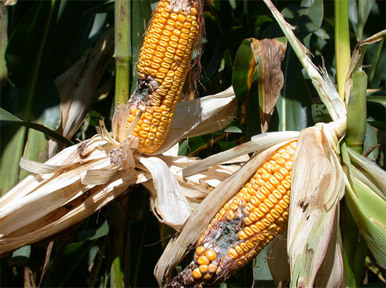 Molds have developed in the damaged areas of these ears. 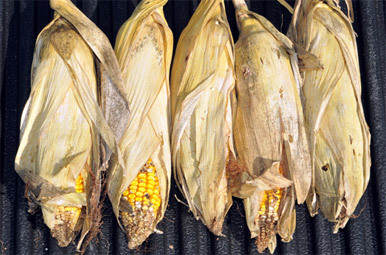 Damaged ear tips and holes in the husks at harvest are indicators of larval entry and/or emergence. Consultant checking a milk-jug pheromone trap for nightly moth catch. 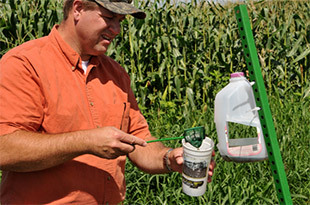 Use of pheromone traps to target scouting efforts is recommended. Moth flight begins in late June, so traps should be in place by mid-June and should be checked weekly. Scouting should begin when multiple moths are being captured with frequency. Initially, monitoring efforts should be focused upon fields that are just beginning to, or soon will, shed pollen. During and after peak flight, female moths may prefer later-developing corn for oviposition. Arrow pointing to the egg mass location of this soon to be tasseling plant. Scout fields by examining the upper surfaces of new and not-yet unfolded leaves of plants in multiple areas of the field. 20 consecutive plants in at least 5 locations are suggested as a minimum. 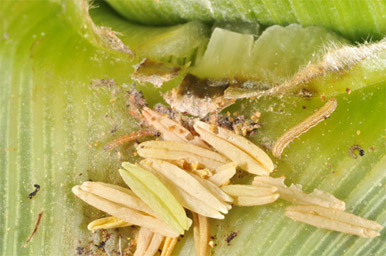 Infestations are very patchy, and oviposition occurs over several weeks so multiple field visits will be required. Upper leaf axils, tassels (before pollen shed), and silks should be examined as well for young larvae. Larvae will be difficult to find once they enter the plant, so the treatment window is restricted to the period surrounding egg hatch. The patchy nature of this pest and its cryptic nature make it a challenge for pest managers. Monitoring and early detection are critical for application of foliar insecticides. There is a suite of insecticides that will kill young larvae, but ensuring they receive a lethal dose before entering the ear is difficult. Economic threshold: Entomologists at the University of Nebraska have recommended treatment when 8% of plants sampling have an egg mass. We recommend lowering this threshold to 5% of plants with egg masses and/or young larvae. A follow-up to egg mass monitoring is a check for larval infestations in the silks and/or ear tip. Insecticide application should be timed so that 90-95% of tassels have emerged. 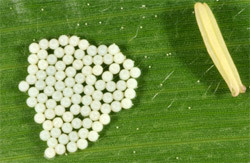 If tassels have already emerged and egg hatch is underway, applications should occur when 70-90% of eggs have hatched. Larvae must encounter insecticide or residue before entering the ear – once they enter the ear insecticide applications are not as likely to contact larvae, making control difficult. 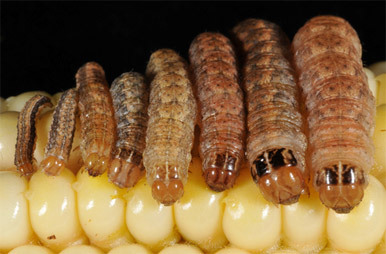 Transgenic options: Not all Bt corn hybrids will control Western Bean Cutworm. 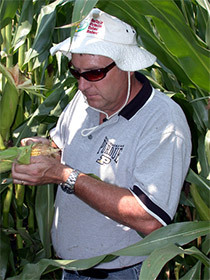 Only Bt corn hybrids containing the Cry1F gene offer effective control of WBC. This includes hybrids marketed under the Herculex I and the soon-to-be-registered SmartStax hybrids. In the few years that western bean cutworm have been known to occur in Indiana, several predators have made them a food source. 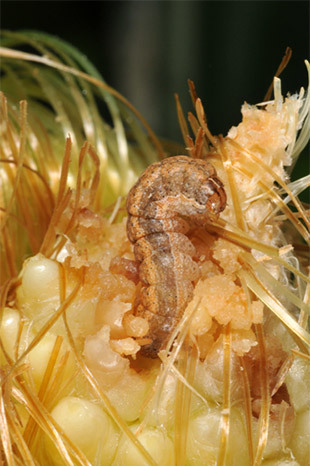 Though it is unlikely that vertebrate and invertebrate natural enemies will prevent western bean cutworm populations from becoming economically important in all fields, it is important to recognize their potential to dramatically reduce larval numbers without use of insecticides. Missing larvae, pecked ear tips, and bird guano indicate avian predation.